Book a grass pitch in Pete's Field and you'll get space to pitch your tent in a big field on a small working farm on the Kent Downs. Our camping field is pretty basic - but just right for enjoying the great views it has of the Kent Downs Area of Outstanding Natural Beauty. There's no electric hook-up available at any of our spacious pitches as we like to keep things simple, but you will be able to have a campfire if you've got an off-ground fire bowl (if you don't have your own, we have some to hire on site). You'll have access to our facilities which include flushing toilets in a converted container and open-air bucket showers and washing-up sinks. You'll also have the Cole Farm cows and calves as your neighbours and birdsong as your alarm clock! Care-free, pop-up camping in the Kent Downs, with ample space, glowing campfires and expert owners. Our quiet, campsite, Pete's Field, is popping up at Cole Farm in the Kent Area of Outstanding Natural Beauty for the second time in 2019. We'll be open for four weeks only and will be offering back-to-basics camping – with campfires allowed. We have 20 pitches for people with their own tents and four bell tents set up for people who don't fancy pitching their own. If you like wildlife, walking, quiet camping and campfires, why don't you join us? As a pop-up campsite with a focus on camping, we don't have a snazzy facilities block, wifi or even electric hook-up, we just offer classic camping where watching sunset over the Downs and toasting marshmallows on the campfire counts as entertainment. Having said that, as keen campers ourselves, we know how important it is to have clean toilets and a place to scrub up after a night around the campfire so we've got a cleverly converted container with flushing toilets as well as open air bucket showers and washing-up facilities. We keep Pete's Field peaceful with a no amplified music policy, quiet after 10pm and cars parked in a separate field. Our bell tents are simply furnished and set up for four with a double mattress on a futon base for a comfortable night's sleep as well as fold-out beds for kids (or extra adults). We also provide a picnic bench, two camping chairs and a fire bowl with your tent and cooking equipment that's suitable for use over the flames. We'll even thrown in a few logs to help you get your campfire started. We have fire bowls and braziers available for campers to hire and logs for sale too. Cole Farm is a small working farm owned by the Clayson family who keep a small herd of cows within their 60 acres. They have been kind enough to let us set up in a field in the middle of the farm so we can share the views they enjoy from the farmhouse. Situated in the tiny village of Paddlesworth, which has a pub, a church and a few farms, it is the perfect place to relax, read a book and generally enjoy the Kent countryside. It's also in a great location for visiting the seaside at Folkestone or Hythe, historic Canterbury or Dover Castle. As it's just a couple of miles from the Channel Tunnel and less than ten miles from the port at Dover, it also makes a great stopping-off point if you're on your way to or from France. 2 open-air bucket showers, 6 flushing toilets in a small converted container. Open-air washing up facilities. No electric hook up available. Campfires allowed in off-ground fire bowls (£2 for campers to hire; included in bell tent bookings). Bell tents come furnished for 4 with a double futon and 2 fold-out beds, plus a picnic bench, 2 camping chairs and campfire cooking equipment. The campsite is on a working farm with a small herd of cows and direct access on to local footpaths. 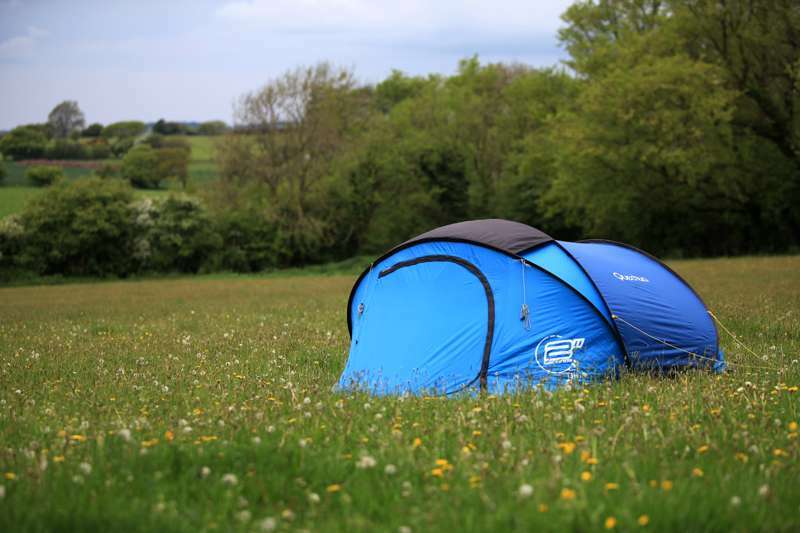 20 grass tent pitches, plus 3 pre-pitched and simply furnished bell tents. Campers, glampers, tents, kids – yes. Campervans, motorhomes, caravans, large noisy groups, dogs – no. The campsite is situated in the Kent Downs Area of Outstanding Natural Beauty, less than a mile from the North Downs Way National Trail. The Kent Battle of Britain Museum (01303 893140) is about a mile away at Hawkinge and there’s a little railway museum and countryside centre, the Elham Valley Line Trust, in the other direction. The harbour, Sunny Sands beach and the East Cliff and Warren Country Park at Folkestone and the quaint town of Hythe with its shingle beach are both a 10-minute drive away. The Romney, Hythe and Dymchurch Light Railway (01797 362353), Port Lympne Wild Animal Park (01303 264647) and Dover Castle are within 10 miles of the campsite and historic Canterbury with its famous cathedral is under 20 miles away. The Cat & Custard Pot (01666 880249) is just 200 metres up the road from the campsite and offers great-value pub-grub. A more extensive menu featuring local produce is served at The Gatekeeper Inn (01303 864345) 2 miles away in Etchinghill. Nearby Folkestone has a wealth of pubs and eateries with fresh fish and seafood available in the harbour and a growing selection of food and drink outlets on the Harbour Arm. Amy and Pete can offer tips on the closest shops and places to buy local produce. Leave the M20 at junction 12 and follow the A20 signposted for the Channel Tunnel to the Beachborough Roundabout. Take the third exit towards Etchinghill. After 1½ miles take a right on to Teddars Leas Road. Follow for 2 miles to Paddlesworth. Cole Farm is on the right. You will need to pass the farm, turn around by the Cat & Custard Pot pub and return to access the drive. The nearest train station is Folkestone Central, 5 miles away. It is well served by taxis. Alternatively get the number 16 bus from outside the station – it also visits the town centre, Hythe and Canterbury. The nearest bus stop is 1 mile from the farm at the Kent Battle of Britain Museum, Aerodrome Road in Hawkinge.